Pharmacy 2000 workflow software introduces order, logic and controls into even the busiest pharmacy settings, so you can ensure safety and efficiency from prescriber to patient. Ready to Improve Your Workflow? Pharmacy 2000 simplifies your fulfillment process, reducing the number of steps to fill a prescription and eliminating unnecessary interactions with software. Distinct workstations for entering, filling, and verifying prescriptions allow users to perform tasks concurrently. Check everything at once – Pharmacy 2000 consolidates orders with multiple prescriptions. Fewer steps mean fewer opportunities for errors. Pharmacy 2000’s systematic process extends safety and accuracy across your entire prescription volume. Barcode scanning, pill managing, and user authentication ensure accuracy for every prescription. Can you imagine paperless processing? We can. Reduce clutter and confusion with images of hard copy prescriptions and access to electronic records, easily recorded and available for review or reporting. Pharmacy 200 interfaces with your pharmacy management system and off-the-shelf hardware for smooth installation and maximum cost savings. 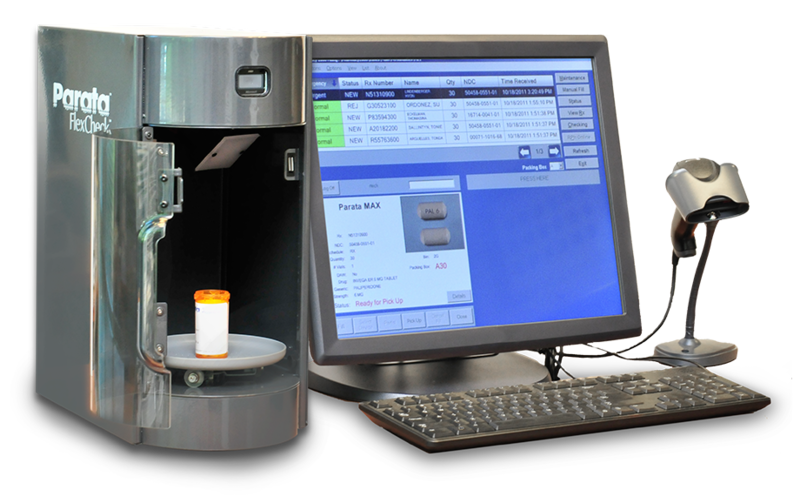 And as the only workflow solution that is fully integrated with Parata Max and Parata Mini automated dispensers, Pharmacy 2000 reduces manual barcode scans, improves safety, and saves time. Equip any Pharmacy 2000 workstation with FlexCheck remote verification application and connect remote pharmacy users and sites.